Have I ever told you about my wonderful neighbors? Well my sweet neighbor Kristina left a bottle of wine on my doorstep on my anniversary so this card is for her. 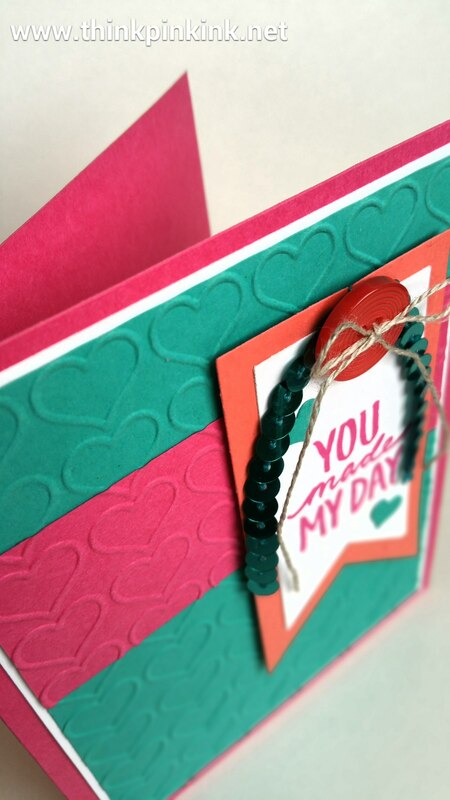 The texture you’re seeing comes from the Happy Heart Textured Impressions folder. 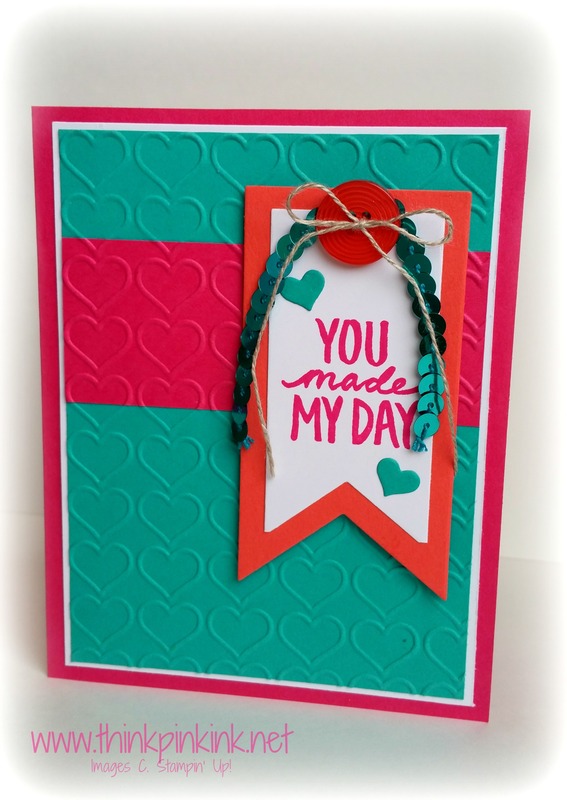 I paired the Bermuda Bay with Melon Mambo and for a little fun threw in the Calypso Coral. The wee little hearts I made from the Mini Treat Bag Thinlit that I posted last time. That thing is VERSATILE! And I just happen to love it! It has been a loooong time since I posted and shared. I bet you can guess what one of my New Year’s resolutions is! 😉 But trust me, I have an excuse. I just found out that we are expecting! So there ya have it, big news on the home front!! I am trying to get back into the swing of things. 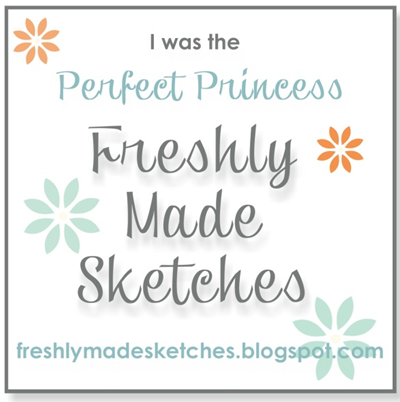 I have a new swap coming up and I was needing some inspiration so I decided to try the Create with Connie and Mary Challenge (CCMC283 – Sketch Challenge). 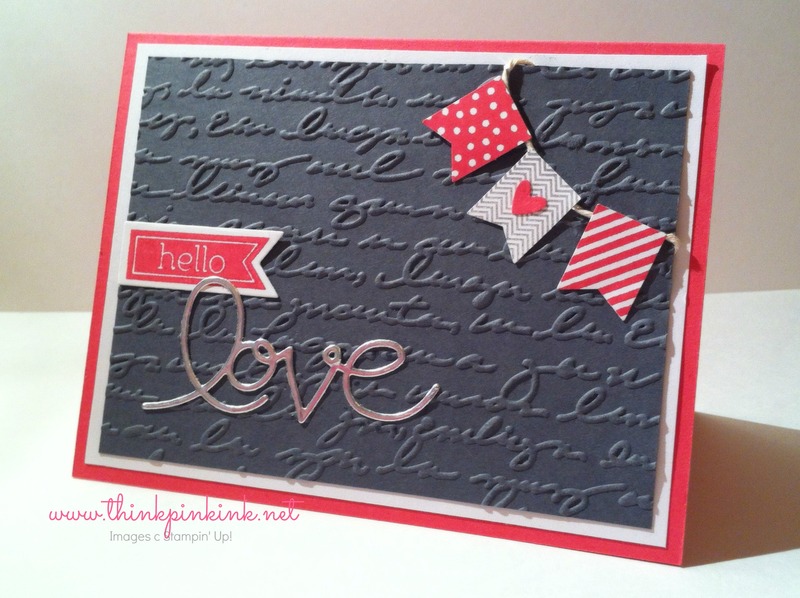 It got my mojo going and I came up with this “hello love” card using the new stamp sets Perfect Pennants and Banner Blast. Also, the Banner Punch is going to be in the next annual catalog so get yours while the gettin’s good!